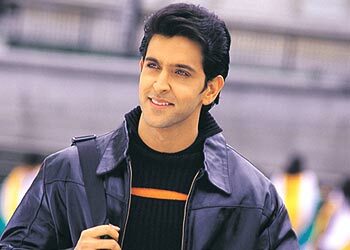 rediff.com: Bollywood's Top 5, 2003 -- Hrithik Roshan! The name is Roshan. Hrithik Roshan. Why is so much attention showered on this 29-year-old actor? Is it his looks, talent or charisma? Or that extra finger on his thumb that makes him distinct? After all, he has only a few successful films to his credit. Barely three years old in the industry, the name Hrithik Roshan has consumed more ink than one can imagine. Hrithik had no illusions about the hardships required to make it in the film industry. Yet, a secret desire to be part of this topsy-turvy world took seed in Duggu (as Hrithik is fondly known). As a child, he appeared briefly in his father Rakesh Roshan's films, Aap Ke Deewane and Bhagwan Dada. Later, he assisted his dad during the making of Koyla (Shah Rukh Khan, Madhuri Dixit). After pack up, Hrithik would enact SRK's scenes and tape them on camera to gauge his own performance. Acting was his only dream. Before he knew it, he was to debut in his father's Kaho Naa... Pyaar Hai. Kareena Kapoor was to be his costar but she walked out of the film after differences cropped up between her mom, yesteryear actress Babita, and Rakesh Roshan. And Amisha Patel walked in. The new millennium saw the rise of Hrithik. Kaho Naa… Pyaar Hai was a blockbuster and transformed Hrithik into a superstar overnight. Money, big banners, a huge fan following, concerts and endorsements followed. His double role in Kaho Naa… won him both Best Newcomer and Best Actor trophy at several award functions. From being a rival of Abhishek Bachchan (who also made a debut in 2000 in Refugee), Hrithik proved serious competition to the likes of Shah Rukh Khan. Hrithik preferred to keep his wedding to long-time sweetheart Suzanne in Bangalore a quiet affair. His marriage didn't affect his sizeable female fan following. Nor did the infamous Nepal controversy, when a rumour suggested that Hrithik had bad-mouthed the neighbouring country, hurt his appeal. His next two films, Fiza and Mission Kashmir, reaffirmed his acting abilities. Unfortunately, they didn't do such great business at the box office. Sceptics questioned Hrithik's staying power when Yaadein, Na Tum Jaano Na Hum, Aap Mujhe Achche Lagne Lage and Mujhse Dosti Karoge didn't fare well. Although Kabhi Khushi Kabhie Gham was a success, it was argued that the film starred Big B, SRK, Kajol too. Hrithik needed a solo hit to prove he was still at the top. His lean phase continued. The much-awaited Sooraj R Barjatya film, Main Prem Ki Diwani Hoon, too disappointed. And then Hrithik pulled the ace from his sleeve: Koi… Mil Gaya. The film, directed by Rakesh Roshan, is 2003's biggest hit. And Hrithik is back where he belongs. At the top.